Today, Monday, February 11 at 3:00 at the Westbrook Performing Arts Center located at the Westbrook Middle School students from the high schools listed below will walk on stage and recite two of their favorite poems. If they advance to the final round they will recite a third one. Students are participating in the Poetry Out Loud Southern Regional Finals. At the end of the day five students will be invited to return for the Maine State Finals being held on Monday, March 11, 2019 (snow date Tuesday, March 12, 2019) at the Waterville Opera House, 93 Main Street, Waterville. For both events, the doors open to the public at 2:30 p.m. and the event begins at 3:00 p.m. No tickets are required. The event is free and all are welcome to attend. 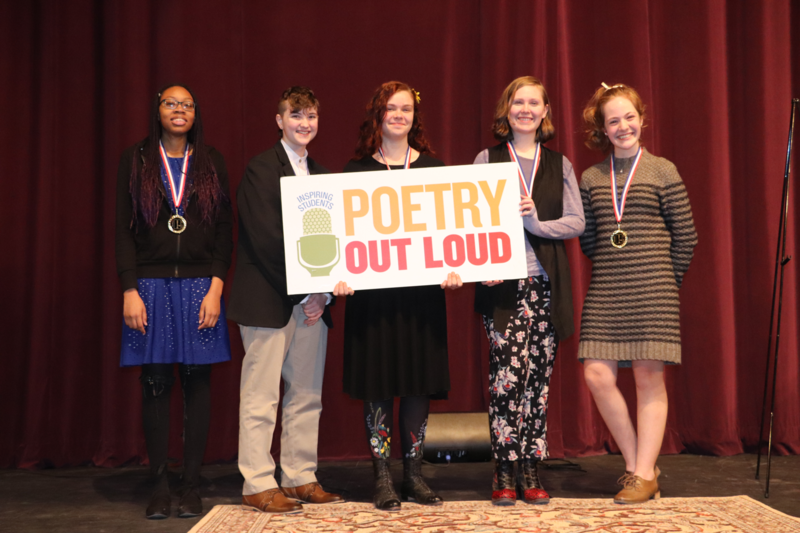 We anticipate that the event will conclude by approximately 5:30 p.m.
Poetry Out Loud is organized nationally by the National Endowment for the Arts and the Poetry Foundation and administered at the state level by the Maine Arts Commission. It begins in Maine’s schools where school champions are selected to compete in two regional finals at which ten students are ultimately selected to recite at the state finals. One student, the state champion, moves on from the state finals to represent Maine at the national finals in Washington D.C., where students from all 50 states, the District of Columbia, the U.S. Virgin Islands, and Puerto Rico will compete for a total of $50,000 in awards and school stipends for the purchase of poetry books. Poetry Out Loud uses a pyramid structure that starts at the classroom level. Winners advance to a school-wide competition, then to a regional and/or state competition, and ultimately to the National Finals.